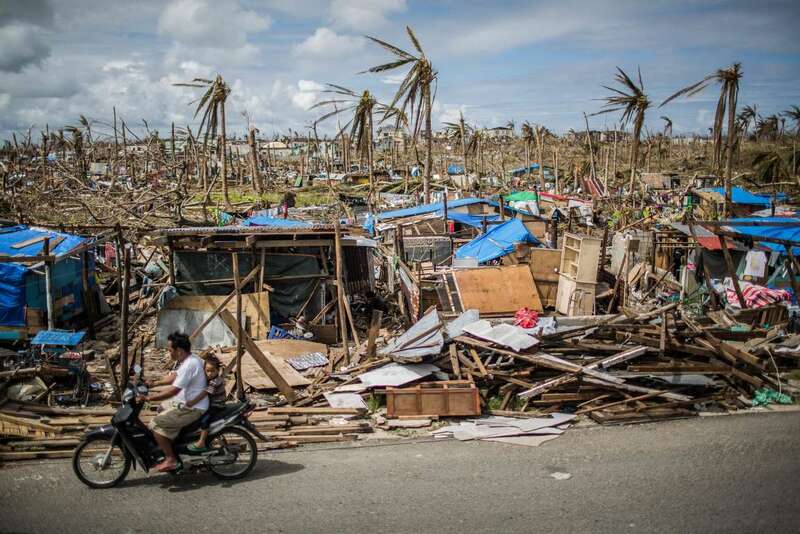 Parts of the Philippines were reduced to rubble by Typhoon Haiyan in 2013. Typhoon Mangkhut struck the Philippines early Saturday, after thousands of people evacuated their homes to dodge the 550-mile-wide storm as it roared across the Pacific. Eight hours after landfall, there were no reports of casualties or major damage, but some places could not be contacted because of power and communication outages. The ferocity of the storm — arriving with maximum sustained winds of around 120 miles per hour — in some ways eclipsed Hurricane Florence on the other side of the world, which was pummeling the Mid-Atlantic Coast of the United States with life-threatening rains and flooding. By midmorning, the storm had weakened somewhat as it continued west. Manuel Mamba, the governor of Cagayan Province, where the storm made landfall, said nearly 10,000 people there had taken shelter in evacuation centers as the typhoon was nearing, and he credited that for the lack of casualty reports so far. The capital, Manila, seemed to have been largely spared. Trees were uprooted and parts of a major thoroughfare, Roxas Boulevard along Manila Bay, were knee-deep in water. People bought food in Tuguegarao as the typhoon approached on Friday. Strong winds and heavy rain battered northern and central Luzon as the eye of Typhoon Mangkhut slammed into the island, the largest and most populous in the Philippines, in the early morning hours of Saturday. The eye made landfall over Baggao in Cagayan Province around 1:40 a.m., according to the country’s national weather service, and it continued to move northwest across the country. The maximum sustained wind speed of the typhoon had slowed to around 120 miles per hour as it reached Luzon’s shores, according to the national weather service, but some gusts still reached up to 200 miles per hour. At 4:30 a.m., the eye was near the town of Lasam in Cagayan Province, according to the Joint Typhoon Warning Center. Heavy rain and battering winds were reported in Cagayan, with Manuel Mamba, the provincial governor, describing the provincial capital Tuguegarao as being “pummeled” during a telephone interview with the ABS-CBN News Channel. Associated Press journalists sheltering in a hotel in Tuguegarao early Saturday reported seeing tin roof sheets and other debris hurtling through the air and store signs crashing to the ground. Meteorologists in Manila said even the typhoon’s weaker winds could be deadly. “It can lift cars, you can’t stand, you can’t even crawl against that wind,” Rene Paciente, a government forecaster, told reporters. Roads were deserted in coastal Ilocos Sur, on the northwestern side of Luzon, as authorities warned of storm surges up to six feet in that province. Trees felled by the storm blocked roadways. The heavily populated Metro Manila area, further south on Luzon Island, seemed to have been spared the worst of the storm. Early Saturday, the national weather service was warning of strong winds and moderate rain in that area — issuing the lowest-level alert — but flooding was still possible in low-lying areas. 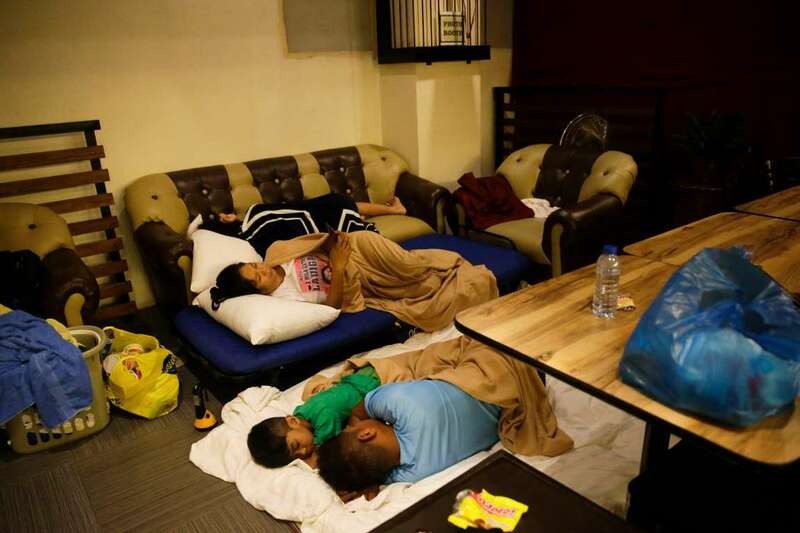 In the northeastern city of Tuguegarao, guests slept in a hotel restaurant early Saturday after their room was damaged by the storm. Hannah Beech, a New York Times correspondent, was heading north along Luzon’s western coast in Ilocos Sur Province the early hours of Saturday. Foliage and trees were strewn across the road, which was almost deserted. After dawn broke, with the authorities warning of storm surges, she and a driver pulled off the road in the town of San Juan and parked near city hall to wait for the eye of the storm to pass. Debris was flying through the air. At one point, the roof of a shed blew past. As they approached Laoag city from the south, they passed many downed trees and some badly damaged buildings. Signs, tin roofs and gates had been torn free and blown around. The roads were deserted except for the occasional emergency vehicle, but some people had ventured outside in ponchos. In larger towns, many windows had been covered with tape for protection, but there was little sign of shattered glass. Braving rain and strong winds from Typhoon Mangkhut in Manila before dawn on Saturday. 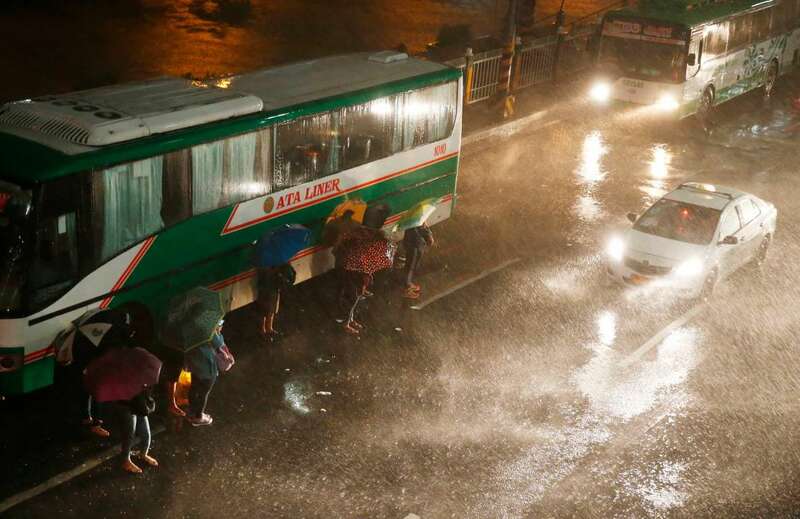 So far, the Philippine capital seemed to have been spared the worst of the storm. 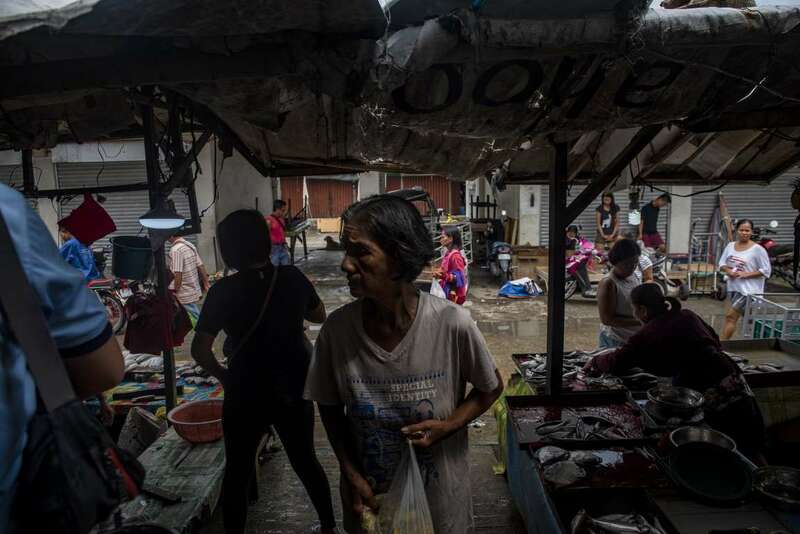 Much of the planning for Mangkhut was informed by Typhoon Haiyan, the devastating 2013 storm that led to the deaths of thousands of people and left more than four million homeless. That storm taught many lessons. Food and fresh water must be in position before a storm hits, as roads and airports may be closed for a week or more afterward because of fallen trees and other damage. Soldiers and police officers need to fan out to restore order as soon as the typhoon passes, so that civil society does not collapse in storm-ravaged areas. And evacuation centers need to be built on higher ground, with stronger roofs. Why is the Philippines calling the typhoon Ompong? The task of naming typhoons falls to the Japan Meteorological Agency, which uses names sequentially from a list suggested by different countries. But when typhoons enter the Philippines’ area of responsibility for storm monitoring, they are assigned a different name by the Philippine Atmospheric, Geophysical and Astronomical Services Administration, the national meteorological agency. It has issued its own list each year since it was established in 1972. Thus, Mangkhut became Ompong in the Philippines. Local names, the agency reasons, are easier to remember in rural areas and make the storms feel more immediate, increasing the chance that people will take them seriously. The Philippine agency also assigns names to tropical depressions, which are not named internationally, because even though they are less powerful than typhoons, they can still cause significant damage. The internationally recognized name for the typhoon, Mangkhut, is the Thai word for mangosteen, a tropical, reddish-purple fruit native to Southeast Asia. The mangosteen, which has a hard shell with white flesh inside, is cheap and plentiful in Asia but rarer and more expensive in the West, where it is nonetheless growing in popularity.